File photo of a Ryanair plane at Frankfurt Airport. 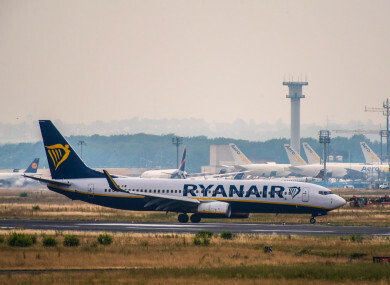 RYANAIR HAS CALLED for a pre-10am booze ban at airports after a group of Irish-based holiday-makers forced an Ibiza-bound Ryanair flight from Dublin to divert to Paris yesterday morning. A group of up to 20 holiday makers were involved in the unruly disturbance and three passengers were removed and detained by French police on arrival at Paris Beauvais yesterday morning. The captain of the return flight from the party island to Dublin yesterday afternoon – which was delayed by 2 hours and 40 minutes as a result of the disturbance – apologised for the delay and explained that the outward flight had to divert due to up to 20 passengers being involved in the disturbance. The captain said that there were children on board the flight and that the flight was diverted for safety concerns of all of the passengers on board. The captain said that the unruly passengers had been drinking at the terminal at Dublin airport prior to take-off. This flight from Dublin to Ibiza diverted to Paris Beauvais after three passengers became disruptive inflight. We will not tolerate unruly or disruptive behaviour at any time and the safety and comfort of our customers, crew and aircraft is our number one priority. Kiely was not able to comment on the costs to Ryanair of the diversion or the legal fate of the three passengers who were taken off the plane. Kiely said that the incident “is exactly why we are calling for significant changes to prohibit the sale of alcohol at airports, such as a two-drink limit per passenger and no alcohol sales before 10am”. Email “Ryanair calls for drink limit at airports after Dublin-Ibiza flight diverted due to 3 'disruptive' passengers”. Feedback on “Ryanair calls for drink limit at airports after Dublin-Ibiza flight diverted due to 3 'disruptive' passengers”.